The third time was the charm for strawweight prospect Nina Ansaroff, as she earned her first UFC victory Sunday, submitting Jocelyn Jones-Lybarger in the final round of their UFC FIGHT PASS featured bout at Talking Stick Resort Arena in Phoenix. Jones-Lybarger wanted a standup battle, and she got one for most of the first round, with her overhand right scoring well throughout. 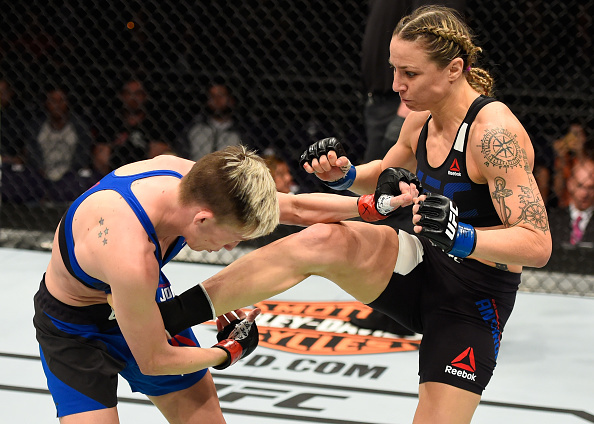 Ansaroff switched things up later in the frame, putting the Arizonan on her back. Jones-Lybarger stayed busy from the bottom, but it was Ansaroff ending the round with several hard ground strikes. Going back to the mat early in the second, Ansaroff began to take control, taking Jones-Lybarger’s back as she sought a submission. She didn’t get it, but she didn’t give up her dominant position either, wrapping up the round. Looking to turn the fight around, Jones-Lybarger was aggressive early in the third, but as she was sent to the mat once more, Ansaroff closed the door on any comeback attempt, her ground strikes opening up the rear naked choke that forced a tap out at 3:39 of the final frame. With the win, Florida’s Ansaroff moves to 7-5; Glendale’s Jones-Lybarger falls to 6-4. A finish was expected in the bout between heavyweight knockout artists Walt Harris and Chase Sherman, and Harris delivered it in style, halting Sherman in the second round. Sherman’s stick and move strategy served him well in the first half of the opening round, but the patient Harris soon found his groove and began tagging his foe with hard punches to the head. A wayward kick by Harris forced a brief halt to the action and gave Sherman a chance to regroup, and when the action resumed, “The Vanilla Gorilla” rallied back. It was Harris landing the harder and more telling shots by the end of the round though. Harris kept pressing the action in the second, scoring more and more frequently on Sherman, who was showing off a remarkable chin. But out of nowhere, Harris landed a flush right knee followed by an equally devastating left hand, and that sent Sherman down and out, with referee Al Guinee calling the fight off at 2:41 of round two. Danish light heavyweight Joachim Christensen picked up his first UFC win in his second try, stopping Serbia’s Bojan Mihajlovic in the third round. Christensen (14-4) had a dominant first round both on the mat and the feet, with Mihajlovic (10-5) unable to get any significant offense together. The second was a little closer, as Mihajlovic began to land some more shots while remaining on his feet, but the action was largely controlled by Copenhagen’s Christensen, and in the third, a flush right uppercut took the judges out of the equation, as the punch put Mihajlovic on the deck, with referee Nic Jones halting the bout moments later at the 2:05 mark. 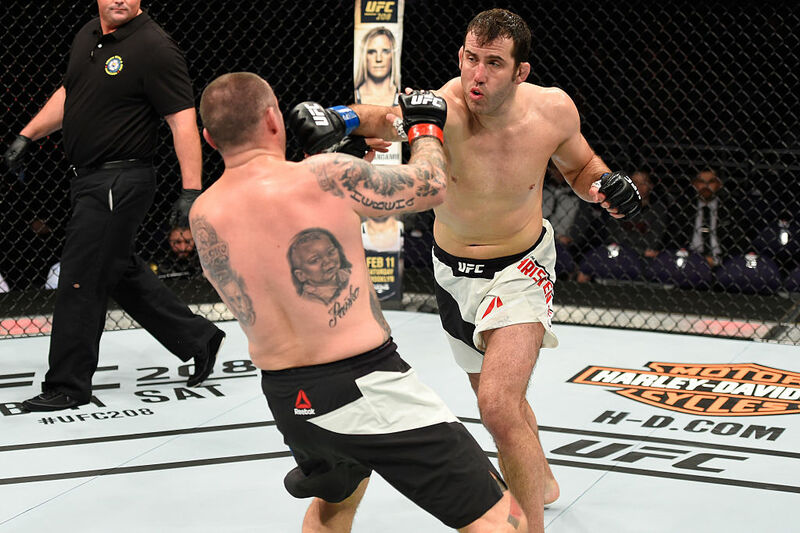 In the heavyweight opener, Cyril Asker evened his UFC slate at 1-1 with a first-round stoppage of Dmitrii Smoliakov. 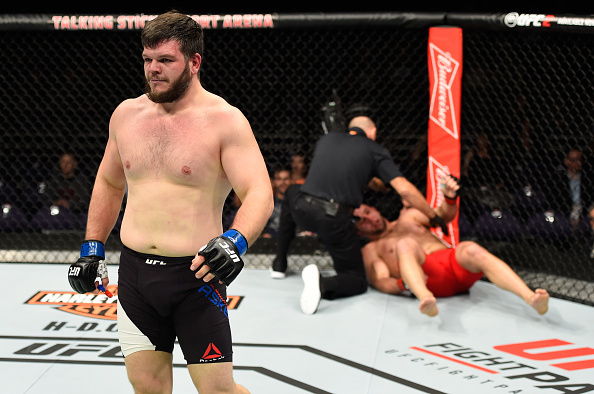 Asker surprised Smoliakov in the second minute with a takedown, prompting a furious barrage from the bottom by the Russian, but after taking a few shots, Asker got into the mount position and fired off strikes of his own. These strikes proved to be the deciding factor, as Smoliakov didn’t respond to Asker’s attack, prompting referee Al Guinee to stop the bout at the 2:41 mark. Avignon’s Asker moves to 8-2 with the win; Smoliakov falls to 8-2.